To begin, gather your fabric and materials. The Picasso Shirt can be made in using one fabric or three fabrics. I'm going to be using one fabric for my shirt, the Olive Double-Sided Organic Fleece. I'll be using both sides of the fabric as a way to feature the contrast as a design element. On the back of the pattern envelope you will see a chart that has size measurements (these are your body measurements), as well as one that has finished measurements. After taking your own full bust measurement, compare that to the size measurement to see where you fall. For instance, my bust is 34ʺ, which puts me at a small. However, the Picasso has a very loose silhouette and includes a lot of design ease. Design ease is the extra fullness added to a garment to create the silhouette. To calculate design ease, take the finished measurement and subtract your actual bust measurement. You may want less design ease and choose to make one size smaller. If you prefer even more ease, you can make a larger size. Looking at the finished measurements and calculating design ease can really help you understand how a garment is going to fit you. Once your pattern pieces are cut, mark all your notches and dots immediately. I start by snipping into my notches, as opposed to cutting triangles that protrude out. Some markings are located on seam allowances that will be trimmed off for the overlapping seams. To mark these notches, use a disappearing marking pen to make a perpendicular line from the notch extending through the new seam line. This way, when you trim your seam allowance, your notch marking is still visible. A technique that we use in many of our patterns, including in the Picasso construction, is the use of pressing templates. Start by making your own template using a manila file folder or tagboard of similar weight. For the Picasso Top, you will cut one template in the following size: 1" wide by 11½" long. 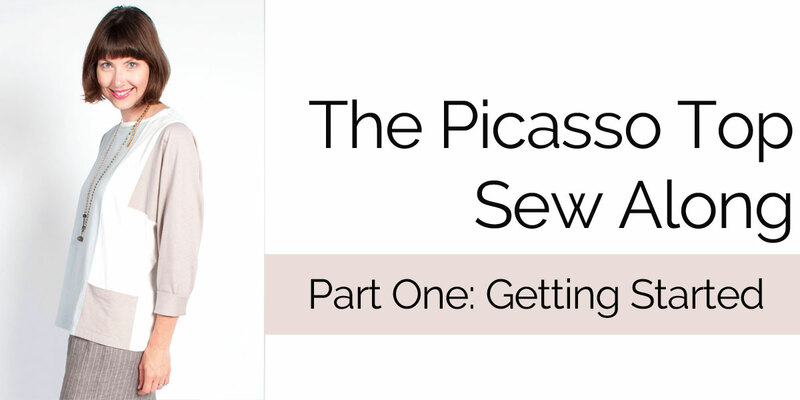 While you can sew the Picasso using conventional seaming, we recommend using the overlapping seam method. If you prefer, you can prepare the seam allowances on all of your garment pieces before you sew, or you can use this same technique as you work through the construction steps. Begin by noting which patterns have you remove the ⅝" seam allowance on the MARKED edges. You will remove seam allowances on the Right Front, Left Back, Left Front and Pocket. Use a chalk marking pen to draw a line along ⅝" seam allowance. ​Cut along that line. Repeat on all MARKED edges of pattern pieces. To prepare the underlapping seams, begin by noting which edges of the pattern pieces match to the trimmed overlapping seams. You will prepare underlapping seams on the Right Back and Left Center Front. Use a Chakoner to draw a line along ⅝" seam allowance. Cut a piece of Fusi-Web the length of the underlapping seam. Place the web just inside the seam allowance near the chalk line. Use your iron to adhere to the fabric. Leave the protective paper covering on the adhesive. Later, when you are constructing the garment you will remove the paper. Once you have your overlapping seams trimmed and your underlapping seams prepared, you are ready to start constructing the garment! Join us back here next week as we start constructing the Picasso Shirt!